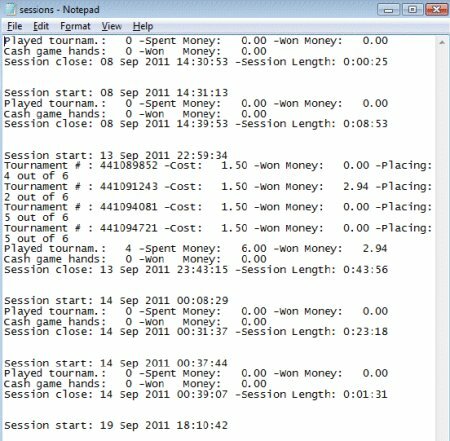 PS Mate is an AutoHotKey application that provides plenty of options to multi-table with ease on PokerStars. The application is available in English and Italian and has plenty of features for reviewing hand histories. PSMate also allows you to cycle through several tables to ensure you don't miss any of the action. PS Mate is a simple product that is specifically designed for multi-tabling on PokerStars and can be used for cash games, tournaments, or both at the same time. The "Mouse Gameplay" tab has three functions: you can have your mouse do all of the work, you can have the mouse move over the “Fold,” “Call,” or “Raise” buttons by using the wheel, or you can go all-in or select the bet slider options. 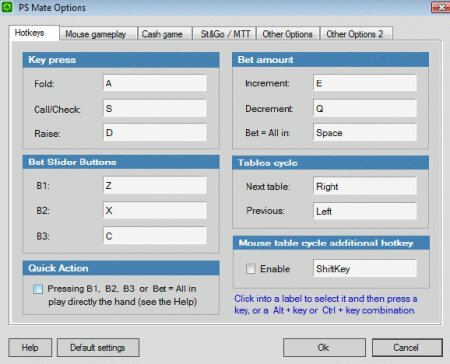 The "Cash Game" tab allows you to set a hotkey to launch a new cash game table. You can also automatically close the buy-in pop-up window and there is a default setting to auto-close the popup window that says, "Unable to find a similar table" for those who are busy opening up new tables. Other options include the ability to show the main lobby with the stroke of a key, toggle between English and Italian, and be prompted by a pre-selected sound file when it's your turn to act. You can check out PSMate by visiting PSMate.com. It's quite a bit cheaper than its competitors and can be a worthwhile investment for players who are just getting into multi-tabling and want to see what an AHK script will do. Try PS Mate out for 30 days and if you're satisfied with the product, you can obtain a password for a €1.90 fee. I like Ps Mate and in my opinion is worth more than what it costs. Thanks to its features I can easily and quickly multitable 12x (that is my present limit). More, its numerous updates show that its authors are ready to solve bugs or add features. Some days ago, for example, has been addes 5 new useful hotkeys. In conclusion, I think it is a low cost advisable program.